What if you could increase quality of life, think clearer, feel better, and recover confidence lost with age? SINCE OUR CARBON 60 IS MONOMOLECULAR, WE CALCULATE THAT IT IS MORE THAN 10,000 TIMES MORE EFFECTIVE AS AN ANTIOXIDANT THAN VITAMIN C, D, AND E, COMBINED! Neutralize Free-Radicals, and Eradicate Many Health Issues! What is Carbon-60™ Organic Sunflower Oil? Our proprietary technology allows us to suspend Carbon-60 in organic sunflower oil with an unprecedented amount of single carbon molecules! These Carbon molecules are atomic in size, which affords them the mobility to seek out and magnetically attach and neutralize mutated cells. A Carbon 60 molecule is made up of 60 carbon atoms arranged into a cage-like hollow sphere, much like the pattern on a soccer ball. Other names you’ll see associated with Carbon 60 include, Buckminsterfullerene, fullerenes and buckyballs. Although the Carbon-60 molecule is very, very small in size, it provides a tremendous amount of carbon surface area. It would take 100,000 Carbon-60 soccer ball molecules to bridge the width of a single human hair. 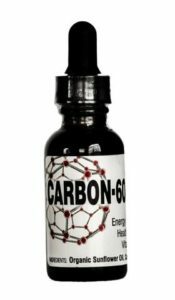 The tiny size of each non-clustered (mono molecular) Carbon 60 molecule provides tremendous amount of carbon surface area allowing the super effectiveness of each individual molecule. What makes the C-60 molecule truly special, is it the only molecule that can share one or two electrons 20 times on each tiny molecule. This process of sharing its electrons enables the Carbon 60 molecule to “repair “damaged molecules. These “damaged” molecules are commonly referred to as free radicals. The Carbon 60 molecule is a very powerful free radical scavenger; much like a superior antioxidant. Cells become healthier, body becomes healthier! Usage: 2/3 dropper full daily. $70.00 for a 45 day supply.